I have been working on another test knit for my friend Jennie of More Twist. 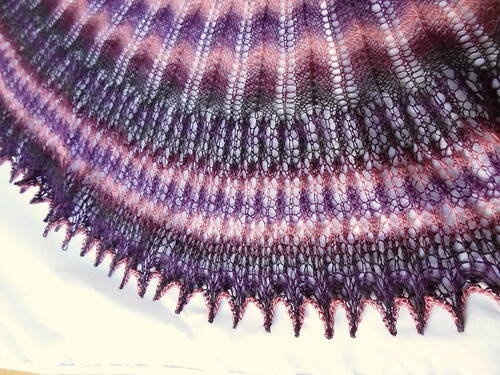 This shawl pattern was inspired by The Hunger Games and the character, Rue, in particular. The pattern is called Rue's Wings. I'm so lucky to have a photography studio (aka my porch!). I just wish it were a tiny bit bigger, I'm always worried I'll get something through the post box and it will tip the tripod over! 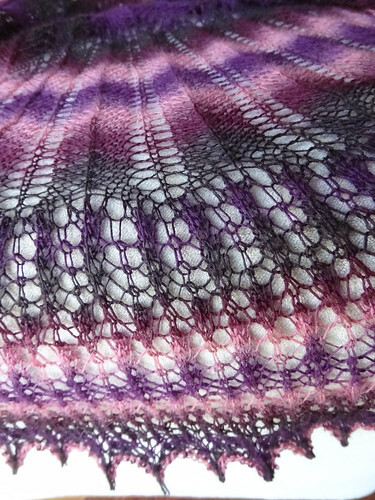 I used Schoppel-Wolle Lace Ball in Berry. I bought the yarn in November 2010 at the Harrogate Knitting and Stitching Show. It is lovely to finally find the right project for this yarn. 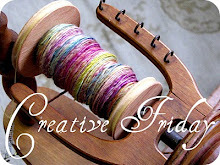 The pattern was designed using Noro Sekku, which is where I got my inspiration to use this yarn. 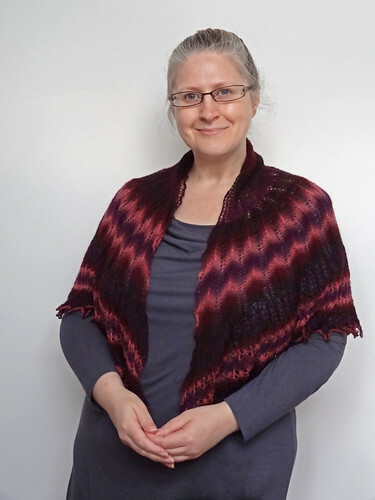 The long colour changing stripes were begging to be used with the lovely chevron pattern in the top half of the shawl. The lace patterns are fairly simple, but if I was stupid and used my KnitPro Options needles with this yarn, which is almost the same colour as the needle tips. I know, very stupid, it made reading my stitches quite difficult in poor light, of which we have had a lot recently. I wouldn't make that mistake again. It was made harder by the small lace repeat at the later stages of the shawl. 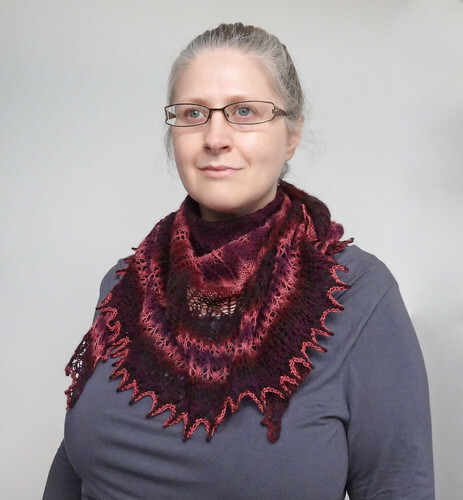 I've seen a version of this shawl from amongst the test knitters in a solid colour, and it looks really good, but totally different. I'm sure it would be lovely to wear under a coat in the Winter to keep my neck and shoulders warm, but I'm more than happy to have my first Christmas present taken care of! Oh by they way, I got listed in the Best of the Web on Be@Home. You can see my details here. 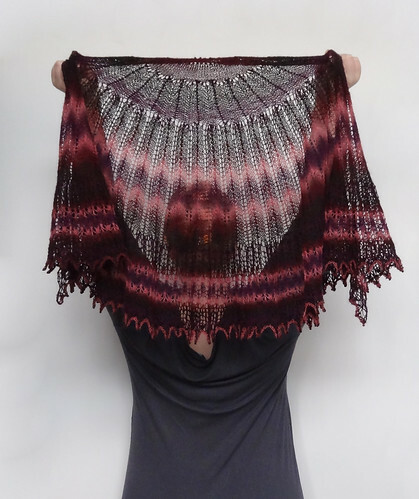 Also, you still have a couple of days to vote on the "Something Different" winner from Blog Week, which relates to the shawl I'm making. 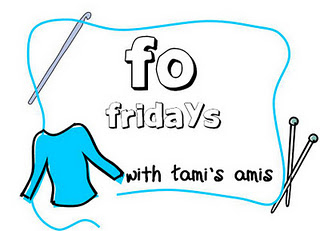 To see other people's fantastic finished objects, click on one of the buttons below.